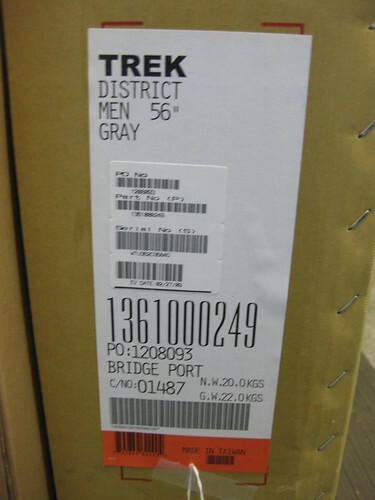 Finally after being pushed back about 8 months the belt drive bike from Trek, the District, is being shipped. One arrived at our shop in Charlotte, NC this morning and we will be building it up this morning. Keep a look out at TheCyclistSite.com for the complete build and photos today! This has me strongly considering selling my classic looking Raleigh One-Way for something completely different. Going to have to swing by the local Trek dealer to see if they’ve got one of these in stock. These guys are hard to come by. We are a concept store and have had them on backorder since September! No wonder it took so long for this bike to come out, its 56″ big! Now if only we could find someone with a 100″ inseam to test it for us! Anyone know the cost of the “District”? No wonder it took so long for this bike to come out, its 56″ big! A key problem though is that the Washington-based IMF is widely perceived as biased. A member of one of the world’s biggest think tanks has reported that economic initiatitives, such as this, would not be possible until the United States is ready to stop using the IMF as an instrument of U.S. policy. Its actions are less than even-handed was how the Fund’s Internal Audit put it – quite a criticism of this key UN agency. Incidentally the Internal Audit section was created primarily because of complaints about the IMF from many quarters over the years. Thank you, you answered the question I have been searching for which was whether or not to place keywords when blog commenting..